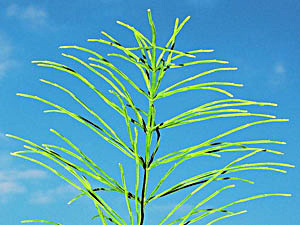 Horsetails have an unusual chemistry compared to most other plants. They are rich in silica, contain several alkaloids (including nicotine) and various minerals. 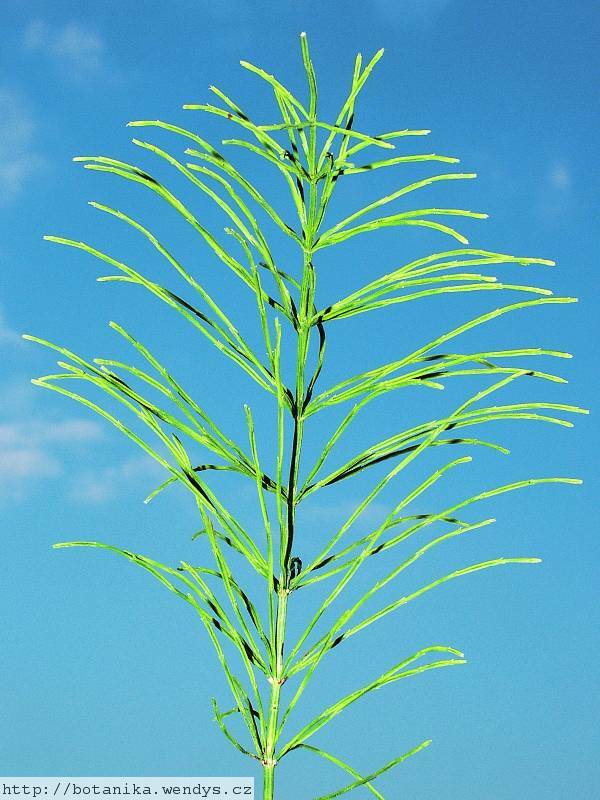 Horsetail is very astringent and makes an excellent clotting agent, staunching wounds, stopping nosebleeds and reducing the coughing up of blood. It helps speed the repair of damaged connective tissue, improving its strength and elasticity. The plant is anodyne, antihaemorrhagic, antiseptic, astringent, carminative, diaphoretic, diuretic, galactogogue, haemostatic and vulnerary. The green infertile stems are used, they are most active when fresh but can also be harvested in late summer and dried for later use. Sometimes the ashes of the plant are used. The plant is a useful diuretic when taken internally and is used in the treatment of kidney and bladder problems, cystitis, urethritis, prostate disease and internal bleeding, proving especially useful when there is bleeding in the urinary tract. A decoction applied externally will stop the bleeding of wounds and promote healing. It is especially effective on nose bleeds. A decoction of the herb added to a bath benefits slow-healing sprains and fractures, as well as certain irritable skin conditions such as eczema. The plant contains equisetic acid, which is thought to be identical to aconitic acid. This substance is a potent heart and nerve sedative that is a dangerous poison when taken in high doses. This plant contains irritant substances and should only be used for short periods of time. It is also best only used under the supervision of a qualified practitioner. A homeopathic remedy is made from the fresh plant. It is used in the treatment of cystitis and other complaints of the urinary system. Open fields, arable land, waste places, hedgerows and roadsides, usually on moist soils. Strobil (the fertile shoots in spring) - cooked and used as an asparagus substitute. They should be used when young but even so it is probably best to change the water, perhaps 3 - 4 times. One report says that they can be eaten raw, they are peeled and the shoot tip is discarded. It is said to be a very tedious operation and they should not be eaten raw in any quantity, see the notes above on toxicity. Some native tribes liked to eat the young vegetative shoots, picked before they had branched out, and would often collect them in great quantity then hold a feast to eat them. The leaf sheaths were peeled off and the stems eaten raw - they were said to be "nothing but juice". Roots - raw. The tuberous growths on the rhizomes are used in the spring. The black nodules attached to the roots are edible. It takes considerable effort to collect these nodules so it is normally only done in times of desperation. However, native peoples would sometimes raid the underground caches of roots collected by lemmings and other rodents in order to obtain these nodules. A further report says that the peeled stems, base of the plant, root and tubers were eaten raw by the N. American Indians, the report went on to say that this may be inadvisable. The stems contain 10% silica and are used for scouring metal and as a fine sandpaper. They can also be used as a polish for brass, hardwood etc. The infused stem is an effective fungicide against mildew, mint rust and blackspot on roses. It also makes a good liquid feed. A light pink dye is obtained from the stem. It is yellow-gray according to another report. The plant has been used for making whistles. Spores - best collected as soon as they are ripe in the spring and surface-sown immediately on a sterile compost. Keep moist and pot up as soon as the plants are large enough to handle. Very difficult. Division. The plants usually spread very freely when well sited and should not really need any assistance. Large quantities of the plant can be toxic. This is because it contains the enzyme thiaminase, a substance that can rob the body of the vitamin B complex. In small quantities this enzyme will do no harm to people eating an adequate diet that is rich in vitamin B, though large quantities can cause severe health problems. The enzyme is destroyed by heat or thorough drying, so cooking the plant will remove the thiaminase. The plant also contains equisetic acid - see the notes on medicinal uses for more information.